How does the vote change with Rubio out? Cast your vote! 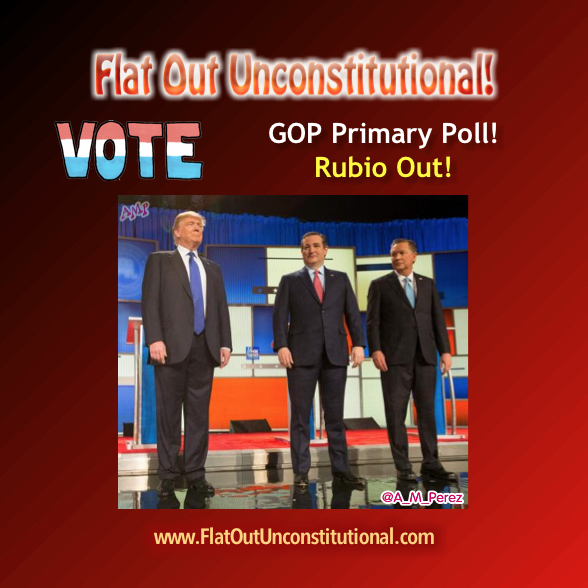 Previous GOP Primary Poll – Post March 3rd Debate! Next Don’t Let Muslim Attack on Brussels Become a Ho-Hummer! Democrats are switching over by 20% – 30% to vote for Trump. Cruz is “to far right” and will not appeal to majority Americans! GOP asked for this movement and now they have it but they don’t like the message boy! So sad but it is what it is so deal with it like we did with Reagan. We need to unite behind Trump or lose the general election to Hillary! It really is that simple. Cruz is our best chance @ beating Hillary. The Donald will be eaten alive in Debates and by the media and his negatives are even much higher Hillary’s .That’s crazy because she is halfway to the pokey and people still like her more than Trump. Kasich is just trying to prove he is a VP candidate. If it’s not Cruz it will be Hillary. Your analysis is falacious, if you follow the money you would know tha Hillary is not concerned with Ted Cruz, they want to take out Trump because he is a threat to her. I feel like the GOP is tearing itself apart. I don’t trust Trump, it doesn’t look good for Cruz, and Kasich is an also ran. Our best hope would be to see Hillary doing a perp walk.